You won't see ALL of the Louvre in a lifetime, but here are some suggested ways to approach your visit to Paris's most famous museum. Many visitors to the Musée du Louvre opt for the traditional solution: wander in, look at some stuff, make your way to Leonardo da Vinci's La Gioconda (the Mona Lisa), gaze at it for a few minutes, then head back out into the bustle of Paris. 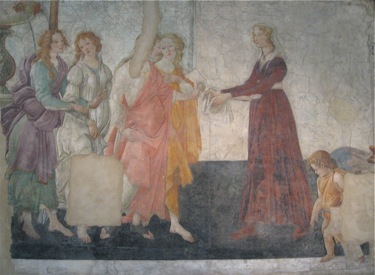 In addition to Mona Lisa, you can see the Venus de Milo, the Winged Victory of Samothrace, frescoes by Botticelli (Venus and the Three Graces Presenting Gifts to a Young Woman, below), Michaelangelo's Slaves, Delacroix's Victory Leading the People, and any others that you have always dreamed of seeing. Decide that you're going to "do" Italian paintings (Denon wing), or French paintings (Sully wing), or Islamic art (Richelieu wing). Or perhaps you'd like to see Egyptian collections, which you'll find in both Denon and Sully. To plan this, you might want to look at the Louvre website, or a detailed guidebook to the museum, which will allow you to choose a limited number of exhibits that you'd like to experience, and go enjoy them. Above, da Vinci's Virgin & Child with Ste-Anne. You can rent a multimedia guide at the entrance to each wing. The guides, which are available in several languages, let you choose whether you want to visit the top works, take a themed visit, or do a visit geared for kids. You can also use the Multimedia Guide to listen to information about selected individual works, which are identified by number. The guide can enhance your visit and help you appreciate the works of art that you see. 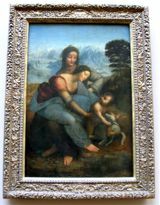 The Louvre offers lots of guided tours (for a fee). Lasting an hour and a half, these focus on different aspects of the museum—some will highlight the most famous masterpieces of the collection, while others will focus on a specific area of interest. Remember that before it was a museum, the Louvre was a royal palace. Stroll from room to room and marvel at the number of rooms, the scale, the lavish decor, the incredible ceilings and gold decoration. If you don't have time to go to Versailles, you can get a good picture of palace life by walking through the Louvre and imagining it during the time of Louis XIV. For a more intimate look at royal life, visit the Napoléon III apartments and other decorative arts in the Richelieu wing. 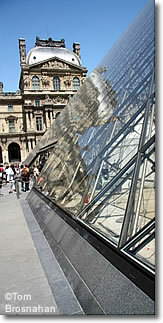 The Louvre collections are divided into the Denon Wing, the Sully Wing, and the Richelieu Wing. Each has different collections and areas of focus. Look over what each has, and choose one to at least begin your visit. Have a look at the Louvre website, or a detailed guidebook to the museum, choose a limited number of exhibits that you'd like to experience (you'll certainly want to spend some time in the Denon Wing), and go enjoy them. OK, I admit this sounds a bit odd. But the Louvre is so big and its collections so rich, how can you go wrong? I did this—just wander—recently and was delighted to discover the Cour Marly and the Cour Puget, two lovely and peaceful sculpture gardens (under glass roofs) in the Richelieu Wing that are great places to see art and get away from the crowds. I also came across Michelangelo's Slaves and an enchanting painting of cherubs that I probably wouldn't have noticed if I'd been trying to follow an itinerary. The Louvre is open until 10:00 PM on Wednesday and Friday evenings. It tends to be less crowded in the evenings, so if you've got the stamina and can work your schedule around an evening visit, you'll benefit from shorter lines, reduced admission after 6 PM, and fewer people fighting to see the same things you want to see. A Paris Museum Pass (or a Paris Pass, which also includes transportation) can save you time, as it allows you to enter the line for ticket holders; you still have to go through security, but you don't have to wait in a ticket line. You can also purchase tickets in advance, online or through stores like FNAC. We all acknowledge that we'll never see everything in the Louvre, but that's no reason not to keep on trying. With my Paris Museum Pass, I went to the Louvre two days in a row. One evening I went to see some specific works, the other day I wandered and discovered new things. Both visits were great. 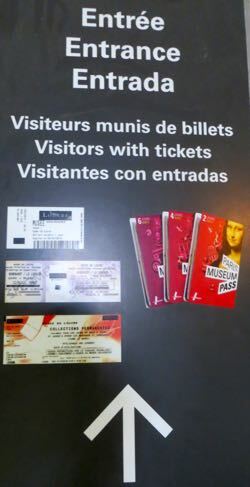 Paris Museum Pass Accepted. Closed Tuesday. Open Wednesday and Friday evenings. 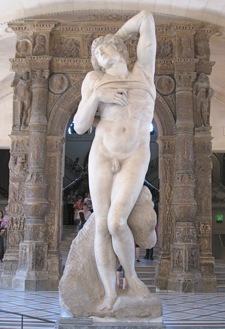 Above, Michaelangelo's Slave, Louvre, Paris. 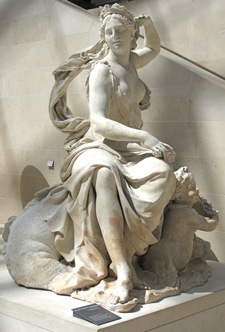 Below, Amphitrite, Cour Marly, Louvre. 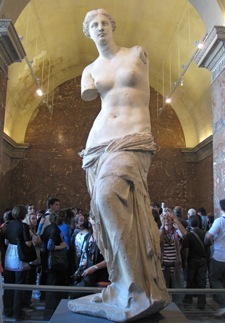 Above, Venus de Milo, Louvre, Paris. Below, Signs indicate entrances reserved for people who already have tickets.